People are sometimes anxious when they have a tooth removed, and fear of the unknown is usually the cause of this anxiety. We would like you to know the steps we take when we extract a tooth, as well as what we do to ensure that you’re comfortable before, during, and after the procedure. Before we begin an extraction, the tooth and the surrounding area is numbed with local anesthetic. 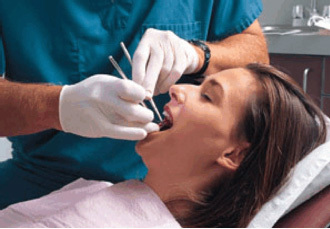 Once you are numb, we use instruments called elevators and forceps to remove your tooth. The elevators are placed next to your tooth and are used to gently roll the tooth out of the socket. Forceps are used to carefully grip the tooth. As we remove the tooth, you will feel pressure. Sometimes, if the tooth’s roots are curved or are tightly held in its socket, we might need to cut the tooth into sections and remove the sections one at a time. This will reduce the amount of time and effort needed to remove the tooth. To minimize problems after your tooth is removed, you’ll need to follow our post-operative instructions carefully, especially for the first 24 hours after the extraction. These instructions will tell you how to control bleeding, how to prevent dry socket, and what to eat and not eat.